Developing your Web presence: On Titanium, Thermite, the Bronze Age and... Drywall! On Titanium, Thermite, the Bronze Age and... Drywall! The process for extracting metals from their ores dates back to the Bronze Age. Despite many modifications, the Bronze Age method to extract copper and tin from their oxides, is basically still in use today for the mass-production of a wide variety of metals and alloys. In the step-by-step guide below I describe a method that allows to extract metallic titanium from white pigment, in your own backyard and using over-the-counter materials! Where does the drywall come into it? Read on! And it works too, I've made nuggets of titanium in this way many times before. 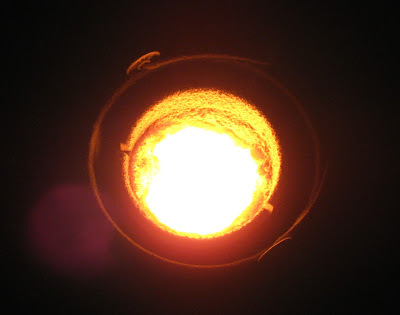 The convenient fact that both reaction products are generated in the molten state (thus allowing to obtain lump metal or even castings) is due to the fact that the reaction is accompanied by massive heat generation, sufficient to heat the reaction products to well above their respective melting points (3,730 F for alumina and 2,800 F for iron). Today, iron is industrially hardly ever produced by aluminothermy but a whole array of more exotic metals and alloys is. And due to linguistic erosion, all aluminothermic processes (even those where iron plays no part) are now commonly referred to as thermite reactions or thermite reductions. Metals (understood here as chemical elements) as diverse as vanadium, niobium, manganese, cobalt and chromium are industrially produced using aluminothermy. Alloys (binary or complex) of these but involving also iron, molybdenum, tungsten, tantalum, osmium and others can be produced similarly. Many other elements, including copper, silicon, boron, lead, tin, scandium, nickel, zinc and a whole raft of others are not usually prepared industrially in this way but can be (and have successfully been) produced by backyard scientists (like me). does not generate enough heat for the reaction products to heat to above their respective melting points (the MP of titanium is 3,034 F), leaving the experimenter with a sintered mass of solid alumina, with solid, powdered titanium metal locked into the alumina matrix. Only melting the whole thing to well above 3,730 F, the MP of alumina, would make the recovery of lump titanium metal possible. Oxidisers capable of oxidising aluminium with great generation of heat are a plenty (in fact, all the metal oxides suitable for thermite reductions are great oxidisers, it just so happens that titanium dioxide isn't very good on its own). Commercially used heat booster oxidisers include chlorates, perchlorates, nitrates and sulphates (there are others, less frequently used). Calcium Sulphate + Aluminium ---> Calcium Sulphide + Alumina + much, much heat! The mixture of calcium sulphide and alumina is usually referred to as the slag. By combining the main reduction reaction (titanium dioxide + aluminium) with the booster reaction in the correct ratios, the required reaction temperature can be increased to almost any level, including that where all three reaction products (titanium metal, calcium sulphide and alumina) are produced above their melting points. From the post-reaction, hot, molten metal/slag mixture, the metal then coalesces out; much like oil separates out from an oil/vinegar salad dressing. After cooling, the metal (the most dense component of the mix) is then found at the bottom of the crucible, nicely protected by the slag from oxidation by air during the cooling step. How to calculate these ratios is outside the scope of this guide but is usually referred to as a thermochemical calculation, which takes into account all the reaction enthalpies and the heat capacities of the reaction products and their abundance in the slag/metal mix and allows a precise calculation of the end-temperature of the post-reaction mixture. For different batch sizes, first calculate the batch factor (BF). For a batch of, say, 300 g, BF = 300 / 100 = 3. Now multiply the individual weights with the BF: 30.0 x 3 = 90.0 g, 25.5 x 3 = 76.5 g and so on. Finally check the result by adding the weights up: 90.0 + 76.5 + 81.0 + 52.5 = 300 g.
Fluorite here is the ingredient so far not discussed. Its role is that of a slag fluidiser. Where above I made the analogy of the metal coalescence from the molten slag/metal mix and the separation of oil and vinegar in a salad dressing, please note that this analogy is in fact very fair and quite accurate. To promote the separating of the metal from the molten sulphide/alumina mixture, it's beneficial to greatly improve its fluidity (reduce its viscosity in other words), as the coalescing metal droplets will find it much easier to sink through the molten cauldron and meet up. Fluorite (chemically calcium fluoride) has a much lower melting point (2,555 F) than both alumina and calcium sulphide and is at those temperatures highly mobile, thereby lowering the viscosity of the melt considerably and keeping it fluid also somewhat longer. It's also completely chemically inert in these conditions, as aluminium is incapable of reducing this particular fluoride. Weigh the ingredients to at least three significant digits: for example 2.56 g, 10.3 g or 315 g.
Dry-mix the powders in a roomy container, typically a hermetically closed food container or similar, by shaking it. I like to include a couple of marbles in the container during mixing, as their sloshing about greatly improves mixing efficiency. Mix until a thoroughly homogeneous dry-mix is obtained, a few minutes should do the job, depending on batch size. Wearing a dust protection mask during weighing and dry-mixing is probably advisable (although truth be told I never do). A good quality grade of titanium dioxide, in the form of fine flour, of good, clean white colour is advisable. Exact granulometry isn't critical. If lumpy, sieve it with a tea strainer or such like. The lumps can later be recovered by gently grinding in a mortar and pestle. Use a no-frills wall filler, the cheaper the better. High-end of the market products may contain additives to regulate setting speed or wetting behaviour that may (or may not) be somewhat detrimental to the thermite process. The wall filler needs to be thoroughly dried to drive off inevitable crystal water (this would otherwise be driven off during the reaction and that could lead to spattering or a porous slag metal mix) and to ensure it's made up mostly of anhydrous calcium sulphate. Dry at high heat for about two hours by spreading the product in an oven proof dish or stainless steel pan. Drying can be carried out (completely safely, wall filler isn't toxic) either in a kitchen oven (use max setting) or on the hob in a steel or copper pan on medium-high heat. The wall filler will probably darken slightly in colour: this is normal. After drying and cooling, store it in a dry, hermetically closed container (e.g. a rubber sealed pickling jar), where it will keep dry indefinitely. It is not particularly hygroscopic but will, if exposed, slowly pick up moisture from the air. The grade isn't critical. I would advise against too finely ground grades, about 200 - 400 mesh is what I use. Higher mesh (finer powder) may lead to too fast reactions and too high temperatures and hence a formulation adjustment may be required (see trouble shooting). And really coarse aluminium (shavings or turnings) would probably still work fine, provided really large (1 kg or more of mix) batches are used and you can get the bugger to ignite. Some pyrotechnical grades of aluminium powder, like German Black, contain significant amounts of carbon and may be less suitable. Fineness isn't critical either. Something of the consistency of fine sand is great. There is no such thing as "too fine" Fluorite, as this species doesn't actually take part in the reactions but merely melts and increases the slag fluidity. While the entire procedure has been designed with the safety of the experimenter in mind, it has to be noted that during reaction temperatures well in excess of 3,800 F are being generated, so keeping one's distance and some rudimentary insulation against these excessive heats are advisable (right hand photo: a 400 g titanium thermite assembly - magnesium ribbon not installed yet). For this an embedded design is used, which consists of an of-the-shelf terracotta plant pot (of suitable size) filled with the thermite mixture, embedded in a larger container (another plant pot for instance) filled with (this is important) dry sand. 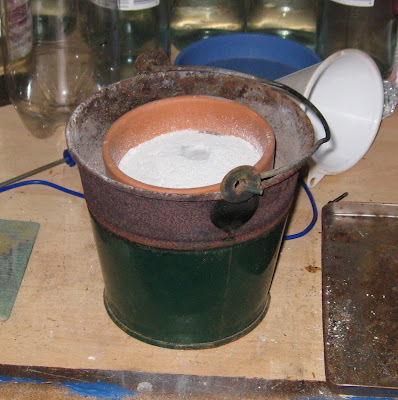 Prior to filling the crucible plant pot with thermite mixture, close over the hole in the bottom with duct tape or similar. Pictures speak louder than words and here's such an assembly at work for a silicon thermite (a cache-pot and small steel bucket are used here). The dry sand insulates the crucible (the sand will get pretty hot, depending on batch size) and holds it together during the reaction: the intense heat inevitably causes the plant pot to crack (but not melt) due to the extreme thermal shock the material is subjected to. For smaller reactions, porcelain drinking cups or even egg cups as smaller crucibles are equally suitable. Of course it's also possible to simply dig a hole in a dry sand pit and embed the thermite crucible in it. Several ignition methods are available, from very safe to slightly riskier, but all involve locally heating the thermite mixture to very high heat to ensure the mixture ignites and the reactions start (if you've ever heard the term activation energy, this is it). My preferred one I've dubbed ignition mix + magnesium ribbon. It consists of separately preparing a small amount of a mixture of dried wall filler and aluminium powder (here the grade of aluminium needs to be sufficiently fine - 200 mesh or finer) in a weight ratio of wall filler/aluminium of 136 / 72. Prepare about 20 g or so and keep it in a safe place, hermetically sealed. This ignition mixture when ignited burns with sufficient heat to set alight even the most stubborn of thermite mixtures (some can be hard to light but the titanium/sulphate boosted thermite has never caused me such problems). 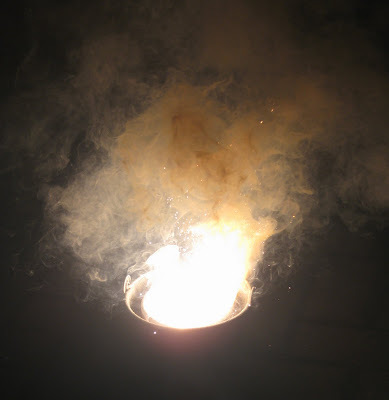 Other experimenters use the potassium permanganate / glycerin ignition method, others simply take a blow torch straight to the thermite mix or stick a fireworks sparkler in it. Personally I prefer my own method, because it allows the experimenter to retreat to a safe distance without a great hurry and is relatively idiot-proof. Leave the assembly to cool down sufficiently for safe post-reaction handling. Lift the plant pot out of the sand insulator: the pot is usually seriously cracked but still held together by a layer of slag sticking to the inner wall. Now break open the slag with a hammer: an annealed mixture of alumina, fluorite and calcium sulphide is pretty hard stuff, so considerable force may be needed depending on the size of the block of slag. Inside you should find nuggets of titanium metal. With my sulphate-boosted reactions, the nuggets (or reguli, if you want to be posh) resemble small new potatoes because of their golden hue (the colour is due to a very thin layer of surface oxide) with some minor surface irregularities. A 20 g test batch will usually deliver a few nuggets a couple of mm across; a 100 g reaction already yields blobs the size of smallish marbles. Much larger reactions are likely to produce roundish slabs of metal. Feel like a real metallurgist and calculate the obtained yield as follows. A 100 g of the mix contains 18.0 g of the metal (but as oxide, of course). Recover as much of the produced metal as possible, including smaller reguli and weigh it. The yield is calculated by dividing the weight of the recovered metal by the weight of the total metal contained in the batch and multiplying the result by 100 %. Yield usually improves greatly with the size of the reaction: for reactions of, say about 1 kg, I'd expect the yield to be well over 90 %. Buff it up with sanding paper: removing the surface coating of oxide reveals the highly shiny, metallic nature of the material. Left alone the shiny surface will slowly tarnish again, forming a new layer of oxide. This process is known as passivation and protects the metal against further attack from air oxygen. It shares that property with aluminium (and other metals/elements). Check electrical conductivity (press the electrodes against freshly sanded surface): the material conducts electricity, confirming its metallic nature. Flame test: press a piece of the metal against a fast spinning sanding wheel or similar. Small fragments of the metal will be torn off and burn up spontaneously in the air. Nice to watch and fairly unique to titanium. Watch a video by my friend Jeffrey on the page below, using metal from a chlorate boosted reaction (my formulation). Scroll down to almost the bottom of the page. Chemical identification: for this you'll need strong hydrochloric acid (HCl 20 w% or more - 30 w% is better) and some pharmacy or hair dye grade hydrogen peroxide (H2O2, a few w%). Crush up some of the metal with a hammer (due to contamination with oxygen and nitrogen it's rather brittle) and put it in a test tube or otherwise suitable glass container and immerse it in the acid for 24 h or so. As small amounts of hydrogen sulphide (rotten eggs gas - see below) will be formed, store the assembly in a well ventilated place, away from your living quarters. Although titanium is well known and desired for its excellent corrosion resistance, strong hydrochloric acid does attack it noticeably but slowly even at ambient temperatures, with the ubiquitous evolution of hydrogen gas. Titanium (III) chloride (TiCl3) is formed, which, depending on concentration has a beautiful, amethyst-like purple hue. After the overnight soak in HCl, carefully add a few drops of the hydrogen peroxide to the solution: a beautiful deep red, caused by a very characteristic red colour from a titanium (IV) peroxo complex being formed. A more detailed explanation can be found here. 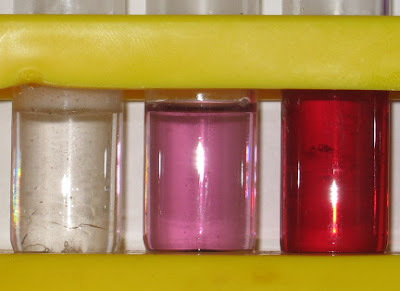 Below, from left to right three test tubes: titanium starting to react with strong HCl with bubbles of hydrogen starting to form (left), after some time of reaction the typical Amethyst purple of TiCl3 appears (middle), after adding H2O2 to some liquid from the middle tube the deep red colour of the titanium (IV) peroxo complex confirms the presence of titanium (right). Why does it smell slightly of rotten eggs? To keep specimens of the metal without resorting to de-slagging, storage in hermetically sealed glass containers or ampoules is recommended, to allow admiring the metal without experiencing the faint but unmistakable smell of rotten eggs. It's also advisable to dispose of the slag and broken crucible by either putting it in some disposable sealed container or wrapping it amply in bin bags, before disposing of it in a domestic bin, to avoid the lingering smell of rotten eggs around the house. 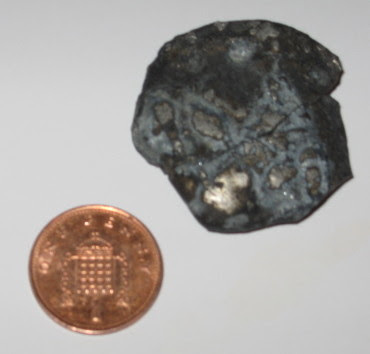 I'll assume that in the case of problems, weighing, mixing and ignition were all carried out correctly, the correct ingredients were used and the thermite burned right through but that no metal or very poor quality metal was formed (right hand photo: the post-reaction melt of a 400 g titanium thermite reaction). The most likely cause of poor metal production is not that the metal didn't form but that it didn't coalesce out of the slag/metal mix. The most likely reasons are either: reaction ran too cold or reaction ran too hot. The main cause of aberrant temperature behaviour is fineness of ingredients but this should be rectifiable by adjusting the overall formulation slightly. no metal can be found or metal is too intertwined with solid slag mass and cannot be broken away from slag. Excessive sticking of the metal to the solidified slag (good metal breaks away clean and easily). This is indicative of too low reaction temperature, leading to too high slag viscosity. This problem should be remediable by increasing the amount of booster reaction. For the 100 g batch described above, increase the amount of dried wall filler to 30.6 g and the aluminium powder to 29.6 g (the total batch weight then becoming 107.7 g) and try again. The main reason of too high reaction temperatures can occur is the use of very fine ingredients: ingredient fineness in heterogeneous reactions to some extent regulates reaction speed and very fast reactions tend to lose, proportionately speaking, less heat to the environment and this can lead to overheating. At very high temperatures, even the most high boiling substances gain some degree of volatility. This evaporation can interfere with the metal coalescence, a bit like it would be hard for the oil in an oil/vinegar salad dressing to separate out, if the dressing was actually boiling. Try and remedy this by reducing the amount of booster reaction. For the 100 g batch, use 20.4 g of dried wall filler (instead of 25.5 g) and 24.4 g of aluminium powder (instead of 27.0 g), making the total batch weight 92.3 g and try again. I would like to attempt something useful with this method, would it be OK with graphite crucible/mold and argon atmosphere? How much Titanium would you get per 100grams of the mixture you put into the pot? Theoretically 18 gram. Inevitably some remains stuck on the slag, so in real terms yield is always lower than 18 g of metal per 100 g of mix. It's explained in the article. The metal hereby obtained hasn't been refined, deslagged or forged in any way yet. The crude material does contain some 10 - 15 % acid insoluble residue, presumably slag micro droplets that didn't manage to 'escape' upon solidification. Various measures could be taken to reduce that slag content. Metal obtained this way would normally be deslagged, prior to casting, followed by further refining. As Theo stated: this is not really intended as the road to your $ 700 titanium scissors business. High quality Ti metal obtained via the Kroll process would remain the grade of choice for any commercial venture, it isn't that expensive either. But the homemade Ti is definitely a useful material for those enthusiasts that would want to put it to good use. Well, further refining will make the metal purer of course and thus more 'true' to its 'theoretical' properties (corrosion resistant, very high strength to density ratio, etc). Inevitably, refining here means melting in inert atmosphere and scraping of the so-called 'dross' (slag and assorted metal insoluble impurities) from the melt. As regards mechanically forging (not casting) the crude metal into useful objects, again heating to close to it's melting point, in the absence of air (in vacuum or under argon atmosphere to avoid oxidation or even fire) is really the only way. It is this that, as Gray points out, contributes greatly to the cost of manufactured titanium items. As regards making a simple plate, this could be machined from a button-like blank, at room temperature, using a lathe with a sufficiently hard cutting tool, or so I'd imagine. In principle the coalescing metal could also be cast straight in to a mold, for the production of 'blanks' (subjected to post-casting machining to obtain finished items). Would CaCO3 work? It would seem to me that the properties and uses of that vs. Fluorite are very similar (Calcium Carbonate is used in Iron processing) but it is infinitely cheaper and thus easier to make the Titanium. I've played with CaO (w/o good results) but never with CaCO3. Worthe trying! Were do you get ground fluorite? Is there anything you can use instead of fluorite? Your best bet is a good quality pottery (materials) shop. Minerals and gems shops will probably sell 'off-grade' fluorite (mine does), but you'd have to grind that yourself. It grinds down easily in a granite mortar and pestle. 2 things. Have you ever considered creating a crucible from portland cement and vermiculite/perlite? I think the ratio is 1/5 cement to vermiculite. I know this is what I am planning on using in my forge and it should be able to withstand 4000 degree + temps. I would think making a pot or crucible from this would be fairly easy. Also, have you ever played around with Barium Nitrate? I know Ba(NO3)2 is used in military thermite and in some explosives (flash powder). Would this work instead of the plaster of paris? 1. I've never made a crucible from a Perlite/cement composite but I did use this classic mixture for making a small charcoal fired furnace, see here. Perlite/firecement (NOT Portland) is the 'poor man's refractory'. It would be possible to make a crucible from Perlite/firecement, provided you have proper ways of 'firing' the crucible. Such crucibles would be very resistant to temperature and quite refractory but not very strong or long lasting. Worth doing though, IMHO. i was wondering if there is a way to make titanium which will be resistant to oxidizing??? i am interested in making my own forge, and as a fan of medival weapons i would like to try and forge some. i intend to use titanium instead of carbon steel, having in mind that titanium blade is much more resiliant and hard than carbon steel one. so if not posible to make that kind grade of titanium, is it possible during the thermite process to somehow cause chemical reaction to mix the titanium with the steel for aditional hardness of the steel ? ?thank you. Titanium is very resistant to corrosion, that's one of its attractive features. The metal, however, is very difficult to forge by a hobbyist because forging titanium requires an inert atmosphere (argon blanket), at high temperatures titanium combines with air oxygen very readily. Also, thermite titanium is not ductile because it's contaminated with oxygen. It'd be like trying to gorge cast iron: it can't really be done; too brittle. Adding small amounts of titanium to steel will of course affect the steel's properties, notably hardness and corrosion resistance. This would be done by adding calculated amounts of so-called titanium master alloy to molten steel (so it's only possible if you can actually reach about 1800 C and melt the steel). The titanium master alloy can itself be prepared quite easily by means of a thermite reaction: by co-reducing iron oxide and titanium dioxide with aluminium powder. If the iron oxide/titanium oxide ratio is high enough, this thermite doesn't require a booster system because the highly exothermic reduction of iron oxide provides the required heat. This way, master alloys containing up to about 40 % titanium can be obtained. I've done it and it works. The master alloys are known as 'ferrotitanium' and are industrially prepared by thermite route. If you have the capability to make a decent ferrotitanium master alloy (by means of a thermite reaction) and disperse calculated quantities of it in molten carbon steel, then yes, you should be able to create a titanium enhanced carbon steel. Whether this can easily be forged I don't know. This article has been very educational for me. Thanks. Your writing styles of the blog are nice I liked it very good and good quality. Thanks for the sharing. Have you heard about the magic pills name is to be a Generic Viagra pills it is good for the ED cure. I am new to thermite (was taught how to make black iron oxide thermite in a pyrotechnics class this spring). Can the heat booster you used here be used to increase the heat in a black iron oxide thermite to above the melting temperature of titanium? I assume it could but would imagine that it’s quite dangerous to do so. Classic Thermite ® is already extremely hot burning, so adding extra heat becomes dangerous. Nice titanium making method, Gert.Just asking how pure was the titanium after forging (do crystals form in the titanium metal from the other chemicals), and is the metal that you get from this process able to be forged or machined,Thanks. Hey, great blog about your experience with reducing titanium dioxide! I was looking into doing this so I could use the titanium to electroplate steel (similar to a TiN coating, but anodize-able). I was wondering about the feasibility of using the titanium nuggets to do this. If they were cleaned and prepared by washing in HCl or NaOH (I'm not sure whish would be better, but NaOH wouldn't react), could they be used? Also, instead of using CaF2 to make the metal more fluid, couldn't NaCl be used? It also melts at a lower temperature than the reaction (~800°C), and is a salt. I'm not sure if CaF2 has some other properties that are necessary for making the titanium liquid more fluid. Also, would doing this under argon help? What about just CO2 or nitrogen? Thanks very much! I appreciate any advice you can give me! The nuggets can be polished quite easily and be used as such. To electroplate you need the metal as a solution of one of its salts. TiOSO4 for instance or TiCl3 but solutions of these salts tend to be very acidic, attacking the substrate you want to coat. NaCl cannot be used as a flux because it is FAR TOO volatile: this reaction exceeds 2,500 C end temperature. Only CaF2 or Na3AlF6 (Cryolite) are suitable fluxes: both are inert and have very high boiling points but sufficiently 'low' melting points to cause slag fluidisation. I understand, NaCl would be too volatile. I'm not sure I can get any of the salt forms of titanium, but I was hoping to use titanium as the cathode and conduct the electroplating in a molten salt environment (such as NaCl). That would be highy innovative! Well, I guess I will go ahead and try this then! Thank you *very* much for answering my questions quickly and with useful information. I truly appreciate the help. Thank you! I was wondering if this process could be used to make a ballistic plate? My thought was to make a large batch of the titanium thermite mix in a large flower pot. That way when it cools it would form a large disk at the bottom of the pot. My plan was to clean up the disk and use it as a reactive, bullet proof, target. I guess my questions are will the titanium form into a single disk if done in a large enough pot and also will there be so many impurities that the resulting metal is highly brittle? While it would be entirely possible to make a disc that way (even other shapes would be possible with so-called 'drop-casting'), the unrefined metal is quite brittle and would probably not survive bullet impacts. To refine the metal it would have to be nelted in inert atmosphere (most of the impurities then simply float and can be skimmed off). Considering the high MP of titanium, I'd say 'good luck with that' at the hobbyist level! Earlier in addressing a question from stole you talked about making a titanium master alloy by combined iron and titanium thermites. If I was to refine the resultant alloy, hopefully without it spontaneously combusting with the air, could that possibly be strong and hard enough? Aha, very interesting point: use titanium alloying to further harden termite iron! I’ve actually made ferrotitanium (about 50/50 Fe/Ti), so I know it’s perfectly possible to make such alloys; it requires no heat boosting (the Fe2O3 acts as heat booster! ), just light the straight Fe2O3/TiO2/Al/CaF2 mix. An FeTi alloy with lower Ti content would still be considerably harder than Fe alone, yet have an MP closer to steel, so easier to forge. No refining would be needed, IMHO. But whether such an alloy is sufficiently hard for your purpose is something only experimentation can show. I'm looking at making an alloy of 35%Fe to 65%Ti. That should have a nice low melting point of around 1065C. I'm not sure if that will be enough iron thermite to generate the heat needed. What equations are you using to calculate the end temperature. I know a little bit about thermodynamics so words like entropy and gibbs free energy. Also where are you getting your supplies from and what grade are they? So is that a Ti/Fe eutectic or something? Because 1065 C sounds low. W/o calculation my guess is that 35 % Fe + 65 % Ti would generate more than enough heat (to about 2500 - 3000 C end temp.). Calculation is done by calculating the Reaction Enthalpy for each reaction, then using NIST Shomate equations for ΔH for the reaction products to estimate end temperature (basically ΔHreaction products = n x Cp,reaction products x ΔT, with n the moles of reaction products). It must be assumed that the assembly loses no heat to the environment, as estimating a loss factor is difficult. For fast and furious reactions this adiabatic requirement is more or less true because heat needs time to transfer. It’s best to do everything in moles, then convert to masses. So you’ll need 1 mol TiO2, x mol Fe2O3, (4/3 + 2x) mol Al and obtain 1 mol Ti, 2x mol Fe and (2/3 + x) mol Al2O3. From it the reaction enthalpy can be derived easily. Then work out what temperature increase this causes for 1 mol Ti, 2x mol Fe and (2/3 + x) mol Al2O3. If you’re any good with basic algebra you can just leave x in there as such and obtain a general expression: ΔT = f(x). Don’t forget to account for CaF2: that absorbs some of the heat too… And don’t bank on leaving it out either: as a slag fluidiser it greatly improves yield. We do not accept free advertising to be placed on this blog post. Spammy comments will be deleted without fail. We DO however offer advantageous advertising rates for text adverts or banner adverts (max. 400 x 200 pixels) in the main body of the post. Contact us for pricing (cost per month of advertising). Awesome and detailed post! Hats off to you sir! I'm particularly interested in the possibility of making a damascus with some FeTi in there, altough I'm not sure that the benefits (in performance and aesthetics) will be worth the trouble, or if it will even hold toghether! Any thoughts? Not sure what you mean by a 'damascus'? FeTi is well worth doing and easy too. Ah, a type of steel, right? The FeTi would then be used as a masterbatch to seed the steel with a desired amount of Ti, to modify its properties like hardness, corrosion resistance etc. Yes, damascus steel in a nutshell is just -slightly- various plaques of different types of steel packed toghether and then folded to stack in layers. It's used mostly for aesthetics but it also shields nice performance if done properly. It has been discovered that much of it's impressive edge-holding capabilities come from the formation of carbon nanotubes, this has been found on pieces centuries old. If you use 2 steels with different carbon content (let's say a hard one and a soft one) during the proccess carbon migration occurs and the resulting damascus will have an overall homogeneous carbon content. Now, I'm not very familiar with the theory (I only know basic chemistry, mild physics and hobbyst blacksmithing.. and soap opera english, so sorry for my mistakes BTW '^^) but I wonder if a similar phenomenon would occur if I put a plaque of FeTi on the mix. Moreover, what would happen if I try alloys with different components as well. Of course, 2 adjacent plaques need to be fairly similar to be compatible enough to weld properly, but the possibilities intrigue me. Lastly, speaking of possibilities, the big problem here is oxidation of the titanium, right? I was wondering if I could design a -hermetically- closed pottery container in wich I would place a cilinder in the center, suspended above ground level, with a hole in it's bottom, capped with a small piece of iron. I would then use combustion to exahust the oxigen in said container, simultaneous with the ignition of a self-oxidizing fuse that would eventually ignite the thermite. As the metal liquifies, it would melt the iron cap and flow to a case, obtaining a bar shape. I'm thinking I would have to set a pool to collect slag as a middle step, but perhaps I should look up how this is done in metalurgy and not trying to reinvent the wheel. My question is then, once it cools down, assuming everything went as planned I would have a somewhat pure and non contaminted bar of titanium or whatever alloy I had calculeted, correct? If so, if I wanted to use said ingot as forge material, I would still have to do it in another inert atmosphere? Or that's a problem only with titanium alone, but not ferrotitanium alloys? PS: damn, sorry for the long commet! Remarkable! What you’re suggesting is called ‘drop casting’ and it’s used for making ingots of crude Niobium for example. There is no need to eliminate oxygen: the slag protects the hot metal (Ti or FeTi) perfectly. The mould is placed under the crucible. As you said, a steel or iron membrane is used to prevent the charge from falling into the mould prior to ignition. After ignition the molten alloy melts through it and the metal then fills up the mould cavity. Very similar to ‘thermit welding’ (tram rails and such like). Pure titanium needs an inert atmosphere for casting or forging because it is too reactive towards oxygen. For alloys of Ti, especially at fairly low Ti content (20 w% or less, at a guess) this may no longer be true. It includes calculations for desired FeTi compositions. Also on eBay (most countries) or directly from me (using PayPal). Buy from me and get a discount! BTW, I'd gladly buy your book, but sadly I have no means of making an electronic payment ATM. Check or bank transfer are also accepted. Don't try and make your own crucibles. Honest advice! Preheating? Unless you pre-heat to near 1,000 C most things will thermally shock, apart from high melting alloys. It's not worth doing, at least not for that purpose. Large terracotta pots are cheap as chips. So you throw them away post-reaction, so what? Heh, just the habit of wanting to reuse and recycle things (I make software for a living '^^). Born to Annoy: Liberals, Conservatives and RINOs alike!